Ice Makers are a great invention we just don't like to live without. The most common problems that occur with an ice maker are a failure to make ice, a failure to stop making ice, and the unit freezing up altogether. Other problems with your ice maker may be an odor or bad tasting ice, water not freezing in the ice maker, ice will not release from the icemaker, ice maker over fills with water, or not enough ice being made are to name a few. In some cases we will recommend to replace your in freezer ice maker. One last twist in the tale of icemaker repair is that the problem may lurk elsewhere in your refrigerator such as a bad valve, frozen or broken water lines. 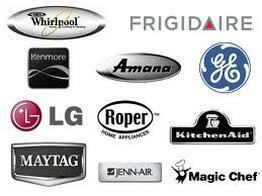 Goodmans Appliance repair can handle all of your icemaker repair needs! We're more than happy to help! Call or Text us at 303-828-6111 for any ice maker questions you may have or click the button above to schedule your repair. "On the 20th of August I returned from a trip to find my ice maker not working. I called a company I had used in the past and had to leave a voicemail. I continued my search online and found Goodman's Appliance Repair's web site. I called and reached Channing. I was delighted that he could fit me in the following day in the time frame I needed. He asked for my model # and showed up the next day in a clean uniform, clean vehicle, and the proper parts to make the repair on the spot. I was pleasantly surprised at the charge. He cleaned all of the area behind my frig as he worked, made sure all was working properly before he left. He was honest, quick, clean and affordable. I will certainly use Goodman's again. I highly recommend his services. - Paula in Aurora"